A £200m upgrade of Derby station is set to lead to disruption on rail services to and from the East Midlands until October. Network Rail said passengers would "benefit from a more modern and reliable railway" when work to improve track and signalling is completed. However, about 80% of trains will be replaced with buses for those travelling to and from Derby. Rail bosses said journey times would decrease following the work. The investment will see 17 km (10 miles) of new track, 79 sets of points, 55 new signals, and nine new gantries, with the work lasting until 7 October. Network Rail said the work was a key part of the "biggest upgrade of the Midland Mainline since it opened in 1870". Mr Newman said: "It's part of the big programme of work going on the line, including electrification, and that will save more money and more minutes [on journey times]." 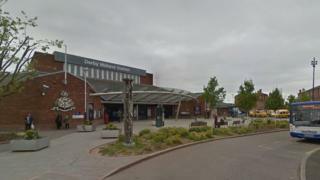 The company said it had worked closely with East Midlands Trains and Cross Country to keep disruption to a minimum and passengers having to use buses would be offered discounted fares and compensation. Adam Piddington, from East Midlands Trains, said: "Resignalling is the biggest investment to Derby station for decades and will improve journeys for the thousands of passengers who travel to, from and through [the city] every day. "However, while the work is carried out it will mean disruption and changes to journeys for customers." Work begins on Sunday and is due to end on 7 October. Follow BBC East Midlands on Facebook, on Twitter, or on Instagram. Send your story ideas to eastmidsnews@bbc.co.uk.